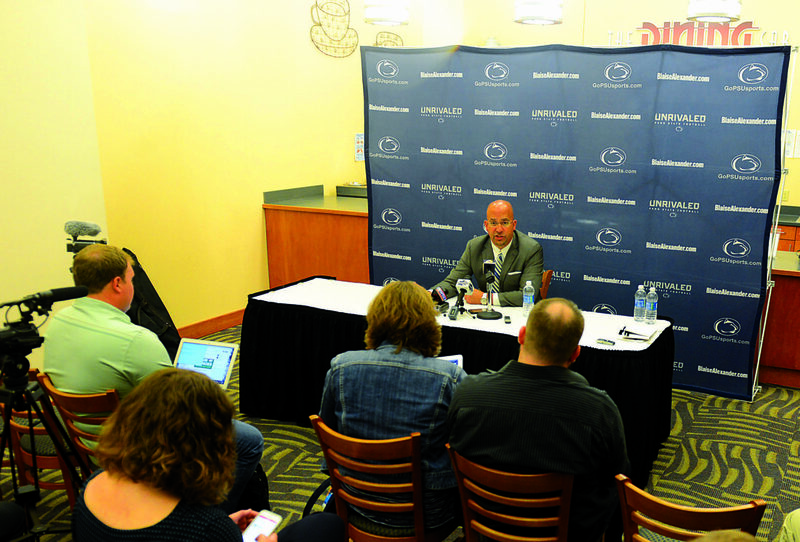 Mirror photos by Gary M. Baranec Penn State football coach James Franklin holds a press conference at the Altoona Heritage Discovery Center. While we wait for the inevitable contract extension for James Franklin following a terrific 2016 season, one thing that’s interesting to start thinking about is how long he will remain Penn State’s coach. Ten more years? Fifteen? Longer? It may seem a bit presumptuous to throw out such big numbers right now, especially for a coach who was on the hot seat — at least according to fans and national media — a month into last season. But if you consider how strong the PSU program is right now (top 10 entering the upcoming season), where it appears to be heading in the short term, and what that short-term success could lead to for the long haul, it’s easy to start thinking that Franklin could be in Happy Valley for a very long time. Frankly, where else would he want to go that would be a better fit? Certainly not the NFL. Franklin fits the mold perfectly of a college head coach — an exuberant, motivation-driven leader who’s a great recruiter and excels at building personal relationships. That type of coach usually doesn’t succeed in the player-driven, all-business NFL. As most who follow the PSU program knew at the time, Bill O’Brien couldn’t wait to get back to the NFL. He wants to coach football, plain and simple. All the rest of the stuff that surrounds the college game were not too appealing to him, and that was magnified immensely having to deal with so much fallout from the scandal and sanctions. Franklin, on the other hand, not only accepts that he has to deal with so much more than just coaching in college, he fully embraces it. All of it. 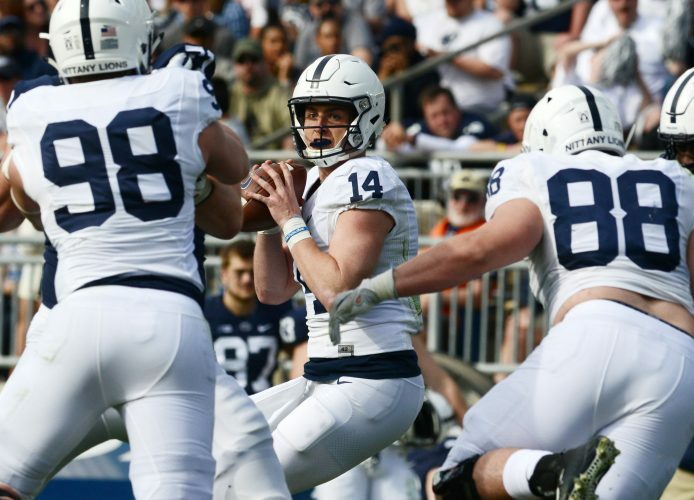 Franklin and Barbour were in Altoona on Thursday for the PSU coaches caravan, and while Franklin wasn’t asked directly what he enjoys most as a college coach, his detailed answers to some other questions painted the picture. “It’s about educating and growing and learning,” he said. “It’s kind of having all these pieces behind the scenes to give our players the best experience when they’re on campus, getting the best opportunity once they leave campus and also maximize their opportunity as football players,” he also said. There were other tidbits of answers that detailed how having a good support staff can help players get good internships or learn resume writing skills. He also addressed how important it is for football players — and college kids in general — to get more sleep so that they can be more productive in their daily lives. That sounds like someone who fully gets and cares about trying to make life better for the student-athletes, which should be the goal of every college coach, although we know that’s not always the case. On the contract front, Barbour mentioned earlier in the week that people should “stay tuned” and added that talks are “moving along.” Franklin, who arrived in 2014, is signed through the 2019 season, and you’d think at minimum he’d get another three or four years added on to that. That would put the coach at PSU for another six or seven years. Obviously that could change if the Nittany Lions hit a rough patch for a two- or three-year period. But with the way recruiting is going, and with Franklin already having shown a willingness to move on from something that’s not working (firing John Donovan and bringing in Joe Moorhead), it’s just hard to see the program slipping to the point where Franklin would get fired. Could he leave for another college job? Sure, it’s possible. But why? His next contract might put his base salary above $5 million a year — elite money for any school — plus, he’s a “Pennsylvania boy with a Penn State heart,” and the university is gearing up for major renovations to Beaver Stadium and other facilities, which will help recruiting even more. One of the most important aspects of any successful college program is stability. Penn State had that for more than four decades, then the program was thrown into upheaval for several years with one change after another. Franklin always talks about how much he loves it at PSU, and now, following one magical season, he seems to hold all the cards when it comes to how long he will stay.